Learn everything about HoloBuilders JobWalk app, from setting it up to connecting cameras and capturing progress with 360° photos. Straightforward creation of your own virtual 360° construction documentation while on the go with JobWalk 2.0 — The new version of the HoloBuilder JobWalk App. 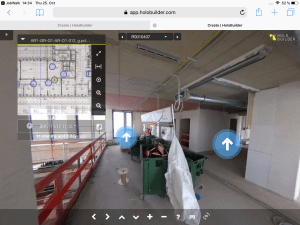 The intuitive interface improves 360° image taking and virtual tour creation with HoloBuilder, enabling you to create your virtual 360° tour while on the go. All you need a smartphone and a supported 360° camera like the Theta V or another compatible camera. The JobWalk app is available for iOS and Android. You can find a list of cameras currently compatible with HoloBuilder’s JobWalk app here. Download a guide for the JobWalk app setup and best practices here! For your tour to be viewed and shared online, it needs to be uploaded to HoloBuilder. You can log in to your JobWalk app account with the same credentials of your HoloBuilder account. If you do not yet have a HoloBuilder account, switch to sign up. Create a new account with your email address. 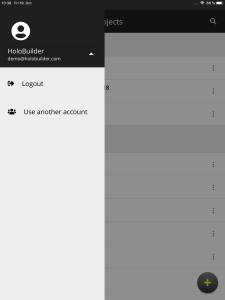 Alternatively, you can also create a HoloBuilder account with your Google+ or Autodesk account login. 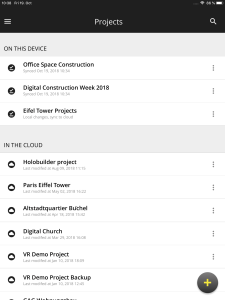 The Projects screen displays the projects you currently have downloaded to the device with the JobWalk app under the header ‘ON THIS DEVICE’ and lists the projects that are ready for download from your HoloBuilder account under ‘IN THE CLOUD’. The magnifying glass in the top right allows you to quickly search through your projects. and display the Logout and Use another account features if you tap on your name or the triangular arrow. Logout: Tap here to log out of your JobWalk account. Use another account: Tap here to log out the current user and switch to another. Disable automatic 360 preview: When checked, disables the immediate image preview when capturing with the 360° camera. This reduces the loading time and increases the capturing speed. Process photos in the background: When checked, enables the image processing in the background during the capturing process and reduces the capturing speed. Uncheck to disable the immediate image processing while capturing and increases the overall capturing speed. Please note, that the image processing will then be done when uploading the project to the cloud increasing the upload time. Upload/Download via WiFi only: When checked, the project will only upload when a WiFi connection is detected. Rotate 360 previews by sensors: When checked, the captured 360° images can be rotated with the mobile sensors when viewing/editing. Room Icon Size: Select the desired size of the waypoints displayed on your sheet. Enable Analytics: When checked, enables us to learn more about the app performance and improved problem reporting. JobWalk App version installed: Shows the installed version number for reference. Please always let us know which version you have installed for reference when you report a problem. Moving this slider to the right to increase the size of the Elements of the Interface, moving it to the left decreases it. Working with small screens, gloves, or in conditions with poor visibility is easier with a larger interface. Find the size that is right for you and your construction site. This screen gives you access to expert knowledge and allows you to contact us. Once you are logged in and adjusted the settings to your needs you can start working with the JobWalk App. 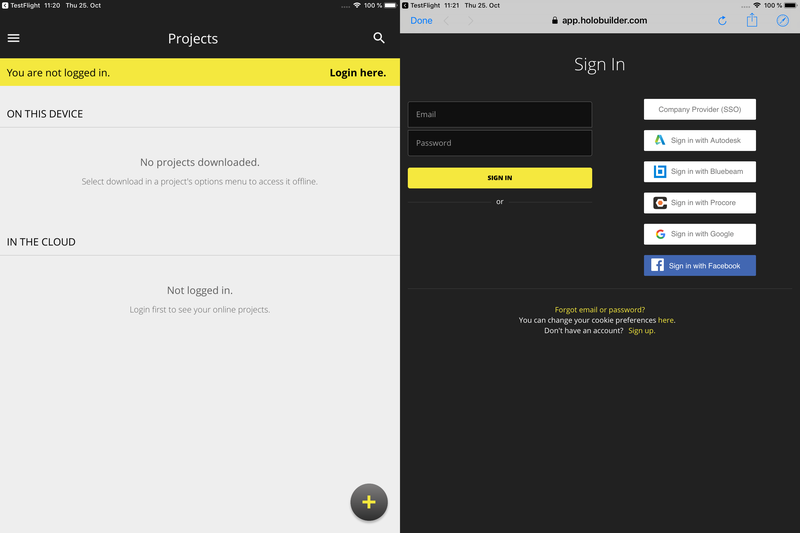 Using the same account, the projects in the JobWalk App are the same you can see in the Web Editor. To learn how create projects within the JobWalk App or work on or contribute to ongoing projects please refer to our dedicated tutorial. 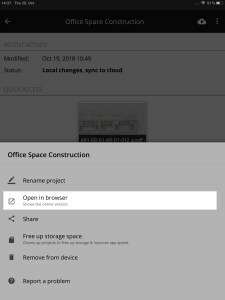 If you create a new project from scratch in the JobWalk App you will need to upload one or multiple sheets to your project. To learn how to work with sheets in the JobWalk App please refer to our dedicated tutorial. Once you uploaded at least one sheet you can start capturing. In order to capture photos you need a 360° camera connected to the mobile device with the JobWalk App. Please find out which cameras are supported and how to connect them to your device in our dedicated tutorial. Once connected, please refer to our tutorial on how to capture 360° photos and create tours with the JobWalk App. Time Travel enables you to take multiple images of a certain location at different times. If you are already familiar with Time Travel you can learn how to use the feature in our JobWalk App to add Time Travels on site in the tutorial. 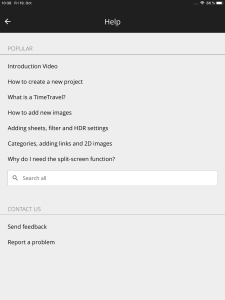 To learn about the feature if you have never worked with it before you should first read the general Time Travel tutorial. All editing options as described above for a job walk can also be used in a team. Work simultaneously on a project to better distribute the workload and become even more efficient. Any progress will be uploaded and merged automatically. Learn more about collaboration projects here. 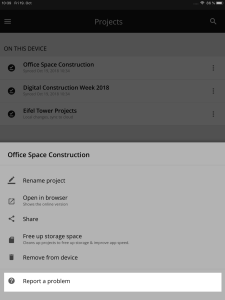 To view and share your tour, tap on the three buttons shown on the top of the screen in the project overview and select ‘Open in browser’. Consequently the project is displayed in your browser and can be viewed as well as shared as usual. We have compiled a list of all compatible cameras alongside step-by-step instructions on how to connect your camera to the JobWalk app in a separate article. If you still have any questions about the JobWalk App or HoloBuilder in general, please let us know by e-mail at support@holobuilder.com or via our integrated live chat. If you experience any problems with a project in the JobWalk app on iOS or Android, e.g. when the project is not uploading, please help us help you by sending an e-mail with the project info log. Select the project that you would like support for and tap on ‘Report a problem’. Your e-mail program will be displayed with some information in place. It’s important that you add a description of your problem so that we can understand your troubles even better and find the solution faster. Thank you kindly for your support. If your JobWalk app looks completely different you are probably still working on JobWalk App 1.0. Please download JobWalk app 2.0 for better performance.